Option Rally opened in 2011 and has been one of the pioneers when it comes to offer good solutions for mobile trading in binary options. Of course, you can access the platform from a computer as well. A negative aspect of Option Rally is that a deposit of 200 USD is required to open a mini real-money account and a 1,000 USD for a standard real-money account. For a novice small-scale trader, this can be a bit much, especially when there are other sites available that only require a 10 USD deposit. Option Rally is available in several different language, including English, Chinese, Russian, Turkish and Arabian. Option Rally is run by Cyprus based OptionRally Financial Services Limited, a company licensed by the Cyprus Securities and Exchange Commission (CySEC). The size of your Open Rally welcome bonus is determined by account type and the size of your first deposit. There is also an upper limit for the welcome bonus. You get a 10% bonus on each deposit to Open Rally (up to the upper bonus limit). A deposit of 200 USD is enough to start a Mini Account with Option Rally. You get access to trading and all trading features, plus market information and weekly analysis. A deposit of at least 1,000 USD is required to open a Standard Account. You get access to everything from the Mini Account, plus perks such as daily recommendations from analysts. You will also have access to junior traders via live chat. A deposit of at least 5,000 USD is required to open a Executive Trading Account. In addition to everything that comes with a Standard Account, you get a lot of personalized features, e.g. personal advice from trading analysts and portfolio managers. The VIP Club Account requires a deposit of at least 10,000 USD. In addition to everything from the Executive Trading Account, you get access to various VIP perks, including market data and a huge set of trading tools and signals. You can contact senior traders via live chat. The trading platform is browser based. No downloadable platform is available. A negative aspect of Option Rally is that you can’t take a peak at the trading platform without registering first. The trading platform comes from Spotoptions, a popular and reputable provider of trading platforms. A lot of binary option sites online use platforms from Spotoptions, so you might recognize the basics if you’ve traded with other brokers in the past. The trading platform is easy to use and few steps are required to complete a trade. A lot of educational material is available for anyone who wants to learn more about various aspects of binary option trading. A trading app named LiveTrader is available for both iOS and Android. Get it from Google Play or Apple’s App Store. It works well on both mobile phones and surf pads. 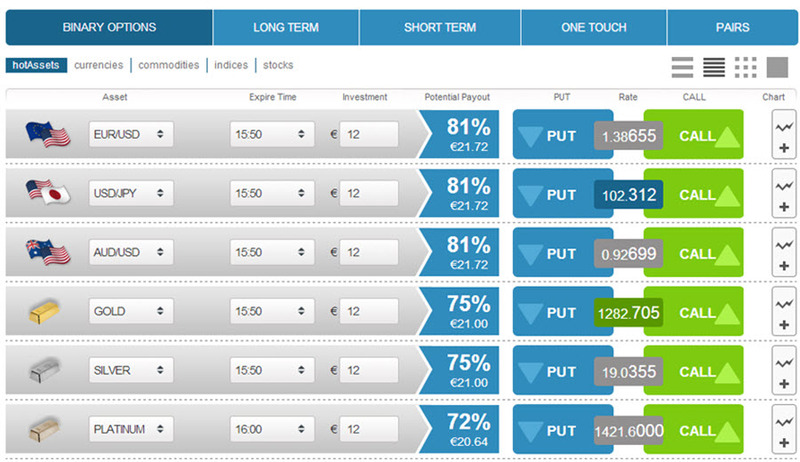 Examples of binary option types available at Option Rally are Hi/Lo, One Touch, Ladder, and Pairs. For those of you that want really short-term binary option, Option Rally is selling turbo options with a lifespan of 30 seconds! When it comes to regular Hi/Lo and Pairs, the shortest lifespan is 5 minutes and the longest is until market close. Ladder binary options have a lifespan of at least 15 minutes, while One Touch lasts for up to 2 hours. The binary options with the longest lifespan at Option Rally expire after 90 days. At Option Rally, the largest category for binary options is the one where currency pairs are the underlyings. This category doesn’t just include the staples, but more unusual stuff as well, e.g. USD/TRY and CAD/JPY. At the time of writing, eight commodities are available as underlyings for binary options at Option Rally. Four of them are metals: Gold, Gold/EUR, Silver, and Platinum. The other four are coffee, sugar, crude oil and NGAS Future. The indices used as underlyings are not that many, but they have been selected to ensure a reasonable geographical diversification. The same can be said for the selection of shares as underlyings at Option Rally. Withdrawals: Option Rally has received criticism for their unusually slow processing of withdrawal requests. Sometimes it will take up to a week before you receive a bank transfer after making a withdrawal request.